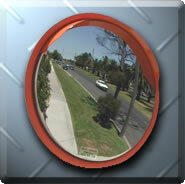 The Only New Zealand designed and manufactured Convex mirror on the market! From the family owned factory in Tauranga, Bennett Mirror Technologies design and manufacture a range of convex mirrors under the Duravision brand. 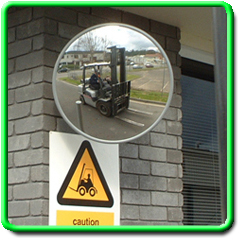 Various models are produced suitable as security mirrors, safety mirrors, traffic mirrors, forklift mirrors and inspection mirrors. 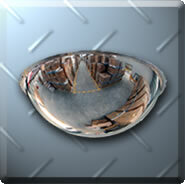 Exported to many countries including Asia where customers are looking for a quality convex mirror. If you want the BEST, then IGNORE the REST! 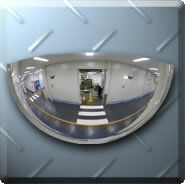 The DuraVision Inspection Mirror is designed for viewing and inspecting difficult to access and hard to see areas. Ideal for security and safety checks on vehicles, machinery and shipping containers. Available in two sizes with adjustable handles. Lighting options also available. 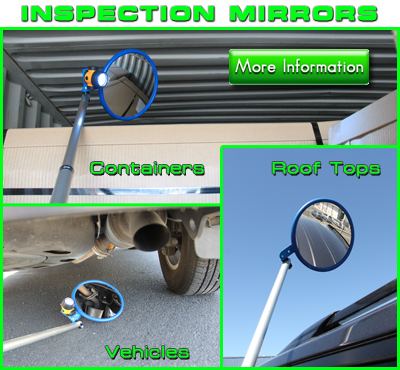 Need help selecting the right mirror for your situation? Click on the Mirror Selector button below and choose from the options to find the best mirror to suit your needs. Ideal for indoor use, the All Purpose Indoor Mirror is easy to install and can be adjusted to any angle with it's zinc plated wall mounting bracket. The distortion free acrylic face has a pure reflective coating and the painted hardboard back is lightweight but strong enough for everyday safety situations. The zinc plated bracket looks smart in both office and retail environments. Secure payment facilities are provided by DPS Payment (NZ address only). Step 1. Use the Mirror Selector button or browse through our catalogue by clicking on the Product button. Step 2. Click on the Buy Now button on the products page. Step 4. 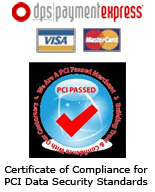 Complete your order with DPS secure Credit Card payment facilities. Step 5. Receive confirmation of your order by email and wait for delivery.